This is by far one of the showiest ornamental grasses to be found. From spring until summer, the soft texture of this native grass mixes easily with other shrubs, perennials or annuals. 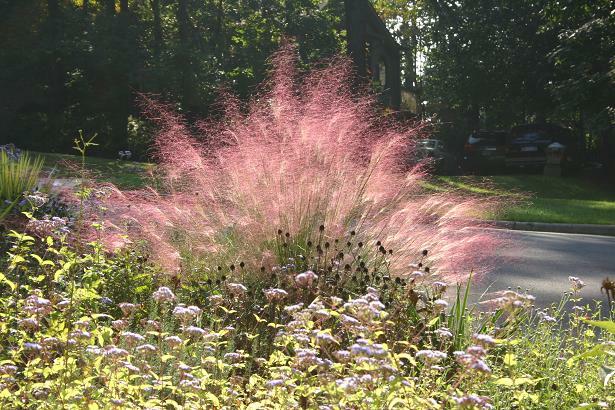 But in the fall, the feathery plumes of glowing purple-pink inflorescences make this plant hard to miss. 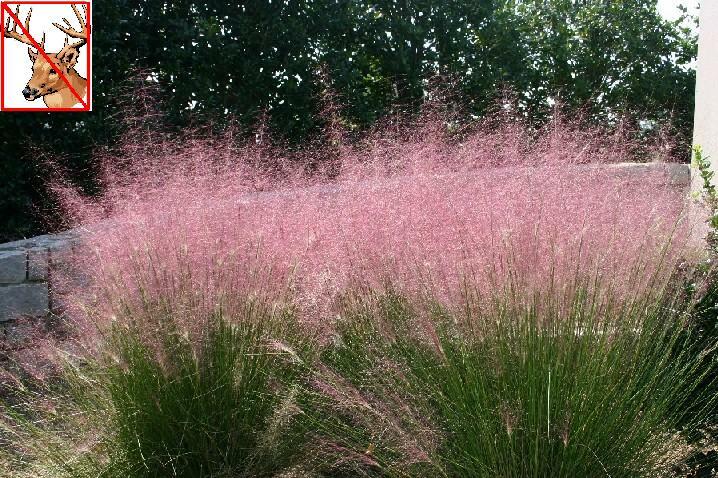 Muhly grass is a warm season grass and does better when planted in the spring, however it's more widely sold in the fall when it's showy. Plant muhly grass in full sun in loose, well-drained soil. Since it's more common in the wild closer to the coast, you can also amend the planting area with coarse sand. One other important note on placement: plant muhly grass where the sun can backlight the plant either in the morning or afternoon (see image below). Combine muhly grass with variegated yucca, mums, asters, pansies, bur marigold, goldenrod or in front of Arkansas bluestar for a stunning contrast of color. Prune muhly grass to six inches tall in early March or any time during the winter when you are tired of looking at it. Divide every few years in the spring to maintain vigor and to remove thatch which can build up after several years. Deer resistant. If you have ever driven I-16 between Macon and Savannah at this time of year you will see large drifts of this grass glowing in the median and along the shoulders, especially as you get closer to Savannah. Muhly grass has also been in the movies. The next time you watch "Forrest Gump" (1994), look for large clumps of blooming muhly grass near Jenny's grave towards the end of the movie.